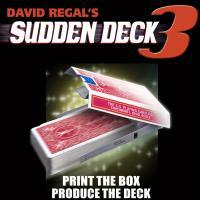 David Regal has released SUDDEN DECK 3. SUDDEN DECK 3 combines ALL the features of the original Sudden Deck with the features of Sudden Deck 2. A precision-made prop, and the perfect way to magically introduce a deck of cards. It’s like carrying a stage illusion in your jacket pocket. For the first time with DVD instructions.